Pinterest. Social media. Teachers Pay Teachers. Blogs. So many fantastic therapy ideas, so little time! As therapists, we have more resources available to us than ever before, but if you don’t have a plan to implement these activities you may end up feeling overwhelmed or scattered from month to month. This has been my first year successfully utilizing thematic units and while I’m a semi-newbie in my fourth year as a SLP, I can say with certainty that units have made my therapy more effective (and exciting!) for every student on my caseload. Here’s a quick how-to guide to get your thematic units started in no time. The possibilities are endless when selecting your themes for the school year. First, look at your school year calendar as a whole and roughly plot out which themes you will cover based on months or weeks. The length of time you choose to target a theme may vary from one to the next. For example, I chose to cover Thanksgiving for two weeks while my emotions unit will be covered for five weeks. Bottom line: select your themes and the amount of time that you will implement each one based on the individual needs of the students on your caseload. Next, select books and vocabulary terms to accompany your theme. I typically select one book per week so that each student has multiple opportunities to interact with each story. Study the books to determine which vocabulary words you will target throughout the week. Because I see kindergarten through 2nd grade, I make a “basic” vocabulary list and an “advanced” vocabulary list. This should be a quick process. Find authors that you know use rich, functional vocabulary and make a list of 5-6 words for each level. If your district provides you with access to a visual materials program, such as Lesson Pix or Boardmaker, you can quickly create visuals to reinforce your vocabulary lists. I post my vocabulary visuals on a vocabulary word wall every week. After you complete a book, follow up with an activity to assess comprehension and generalization of any of your students’ language goals. Narrative retell, comparing and contrasting, using describing words, sequencing, answering and asking questions, following directions, expressive or receptive labeling, and SO many other skills can be targeted through simple games and projects. This is the time to have fun scrolling through Pinterest and doing so with a theme in mind is much less overwhelming. 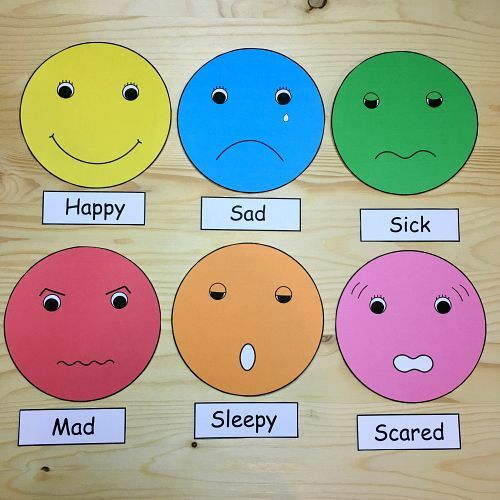 Make emotions books: students will practice drawing a scared face and writing about a time that they felt scared. Of course, assist younger students with writing tasks as needed. Guessing game: students will guess which emotion a peer is feeling based on his or her facial expression. Use a mirror or tablet camera to practice making the facial expressions that accompany the week’s target emotion. You might be four weeks into a unit and pleased with all that your students have learned, but they may not think to share what they learn in therapy with their teachers and caregivers. At the end of each unit, I send home some form of communication so that both parents and teachers can reinforce the language concepts in the students’ most familiar environments. This can be a project your students have completed, a quick letter home listing the vocabulary terms and definitions, or a carryover worksheet. As always, generalization of skills across settings is our ultimate goal and communication is key in that process. Send students’ emotions books home after concluding the unit. Include a brief letter to parents describing what students have learned throughout the unit and how the books can be used to foster language skills in the home environment.